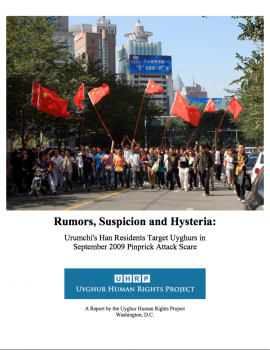 Rumors, Suspicion and Hysteria, a new report from the Uyghur Human Rights Project (UHRP) details the events of late August and early September 2009 in which a series of alleged pinprick attacks shook the regional capital of East Turkestan, Urumchi. The little documented incident gave rise to a series of human rights violations against the Uyghur people that demonstrate the vulnerability of Uyghurs in contemporary China. Allegations that Chinese officials did not investigate credible accounts of killings and beating of Uyghurs during September 2009 are of particular concern. The lack of due process in trials of Uyghurs alleged of conducting pinprick attacks also indicate an absence of international human rights standards for Uyghurs in China. On September 3, 2009, Han Chinese residents of Urumchi rallied outside government offices on People’s Square to protest a perceived lack of state inaction over the unrest of July 5 that year and a spate of alleged pinprick attacks that began the previous month. The alleged attacks took place in the context of an unprecedented 10-month communications blackout in East Turkestan. Since the July 2009 unrest, the Internet, international dialing and personal texting had been cut in the region. Chinese authorities maintained near absolute control over the content of information and its transmission. When rumors began to spread that perpetrators of pinprick attacks in Urumchi were transmitting infectious and fatal diseases through syringes, hysteria among residents in the city reached dangerous levels. As the agency in control of the flow of information and the welfare of all citizens in East Turkestan, the Chinese government mismanaged growing hysteria, which led to, UHRP has learned, indiscriminate killing and beating of Uyghurs. UHRP is unaware of any investigation into violence carried out by Han Chinese or criminal charges stemming from these credible allegations. Chinese officials throughout the alleged pinprick attacks did not move quickly enough to calm down panic amongst Han Chinese in Urumchi through a reasoned explanation of claims made by supposed victims. In its research, UHRP found that no alleged victim was infected with any disease and many of the cases reported in the official media did not result in a credible claim of a criminal act. UHRP believes Chinese officials’ actions further inflamed existing ethnic tension through unsubstantiated claims the pinprick attacks were a result of an organized terror plot. No evidence has been presented to independent observers to verify such serious allegations. Chinese officials’ inability to control mounting hysteria also led to accusations the pinprick attacks had been carried out by drug addicts. In East Turkestan alleged terrorists and drug addicts are invariably Uyghur. Furthermore, officials announced alleged victims of the attacks were predominately Han Chinese, consequently aggravating inter-ethnic sensitivities. All of these public statements resulted in the presumption that Uyghurs were responsible for the alleged attacks. This perception fed into a prevailing discriminatory environment and a post-July 5 unrest atmosphere of resentment against Uyghurs in Urumchi. However, Chinese officials did not move forcefully to protect Uyghurs from the accusation that the attacks stemmed from the Uyghur community. The Han Chinese led protests of early September 2009 were not only an indication of the government’s lack of agency to protect Uyghurs, but also of its double standards in dealings between Chinese and Uyghur communities. The September protests were dispersed with tear gas, whereas Chinese security forces used lethal force to break up Uyghur-led protests in July 2009. Despite a menacing atmosphere during the Han Chinese protest of September 3, 2009, during which demonstrators voiced anti-government chants and threw missiles at Chinese officials, Wang Lequan, the most senior party official in the region, addressed the crowd and reassured them that the government was listening to their concerns. The detentions, trials and sentences which followed the alleged attacks were further evidence that regional officials were singling out Uyghurs in East Turkestan in order to regain control of restless Han Chinese residents in Urumchi. All the publicly known sentences handed down for pinprick attack convictions were given to Uyghurs. Most concerning is that the lengthy sentences, the longest being 15 years in prison, were handed down only two weeks after the alleged incidents had taken place. Given the swiftness of the criminal-judicial process and the calls from Han Chinese residents to government officials that action be taken against perpetrators of attacks, UHRP believes these convictions were tainted by political considerations and fell below the even usual very low standards of due process afforded Uyghurs. UHRP has documented the events of August and September 2009 using interviews with eyewitnesses that were conducted in 2010 and secondary sources, including Chinese and overseas media. In addition, UHRP gained access to an archive of reports from the Urumchi Evening News in Uyghur that demonstrate the kind of information residents in Urumchi received from the government during the communications blackout. The archive, translated into English, forms an important element in the documentation of the alleged pinprick attacks.